The EU’s Game of Thrones premieres today as the bloc’s finance ministers start the process to replace European Central Bank chief economist Peter Praet, whose term expires in May. It’s the first in a series of top EU jobs — including the most revered prizes of ECB and EU Commission presidents — which are up for grabs this year. Meanwhile, worrying signs of weakening growth, troubled banks and fractured politics are multiplying. Fiscal Rules | Finance ministers will also discuss fiscal policy, the design of a euro-area budget and stalled plans for a joint insurance scheme for bank deposits in the currency bloc. Despite deep reforms over the past decade which allowed the euro to survive against the odds, last week’s headlines from Italy and Germany show how the so-called doom loop between public coffers and banks has yet to be severed. Plan B? | Theresa May returns to the House of Commons today to explain how Brexit will move forward after cross-party talks yielded no alternative plan to the one rejected by Parliament last week. If there does end up being a delay, EU governments disagree on what sort of timeframe should be permitted. The only glimmer of hope for May was some conciliatory words from Angela Merkel. Alstom Appeal | French Finance Minister Bruno Le Maire will make a last-ditch push to save Alstom’s rail merger with Siemens during a Paris visit today by EU’s antitrust chief Margrethe Vestager, who is also due to meet with the French company’s trade unions. But it may be too late. Copyright Rules | Google and Facebook are getting some breathing room as the EU pushes the platforms to compensate creators and publishers for showcasing their work. The controversial new copyright rules were set to be agreed as soon as Monday evening, but a final meeting of lawmakers has now been postponed due to disagreement on the package between member states. Trans-Atlantic Trade | It’s a “he said, she said” situation and it doesn’t look good. As the U.S. and EU gear up for free-trade talks, disagreement over what will be negotiated could sink the effort. Greek Showdown | Thousands of Greeks marched through the streets of Athens Sunday to protest the compromise with Skopje over the Macedonian dispute, as Prime Minister Alexis Tsipras prepares for another showdown in parliament this week. Despite the noise, expect the deal to be approved by the Greek assembly, paving the way for North Macedonia’s accession to NATO and — eventually — the EU. Hungarian Protests | Hungarians staged nationwide protests again on Saturday and threatened the first general strike since the end of communism to pressure Prime Minister Viktor Orban into repealing a controversial new law on overtime. Even so, the chances for a political change are slim given that Orban’s Fidesz has about as much support as a handful of opposition groups combined. Swedish Solution | Sweden has a government after the longest political standoff in the country’s history. But the establishment’s struggle with anti-immigration nationalists is far from over, Rafaela Lindeberg and Amanda Billner report. A decade after the financial crisis poured flat champagne on the World Economic Forum, gold-collar executives due to gather in Davos this week have bounced back. 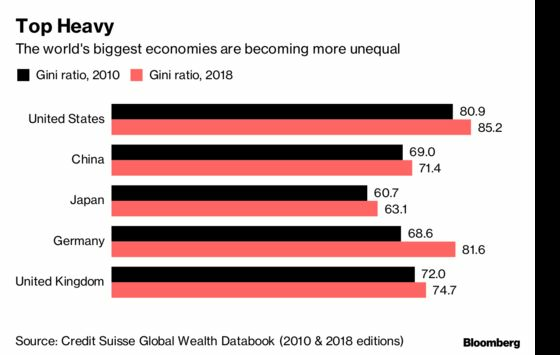 Inequality across the world is growing, and the gap between the have-nots and the have-a-lots — those in the top 0.1 percent — is widening.